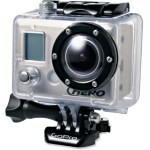 GoPro’s HD HERO is the world’s highest performance wearable 1080p HD video and still photo camera. Professional quality 1080p / 960p / 720p HD resolutions record at 30 and 60 frames per second (60 fps in 720p). Record up to 2.5 hours on a single charge and up to 9 hours total on a 32GB SD card. 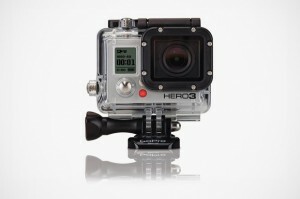 The Wi-Fi enabled HERO3: Black Edition is the most advanced GoPro, ever. No expense was spared during its development, resulting in a GoPro that is 30% smaller, 25% lighter and 2x more powerful than previous models. Wearable and gear mountable, waterproof to 197′ (60m), capable of capturing ultra-wide 1440p 48fps, 1080p 60 fps and 720p 120 fps video and 12MP photos at a rate of 30 photos per second, the HERO3: Black Edition is the world’s most versatile camera. The HERO3’s reduced-distortion, 6-element aspherical lens combines with user-selectable Ultra-wide, Medium and Narrow field-of-views to deliver more perspective-capture options than ever before. Add the totally updated flat-lens waterproof housing that delivers stunning image sharpness both above and below water and you’ve got one of the most powerful and durable image capture solutions on the planet.